Excellent Cigar, just received my second box. Will be ordering again. Excellent service and fast shipping. Just received these and couldn't wait to try. Nice Cigar but needs a little more time in the humidor . Package arrived in excellent condition, Great Service! 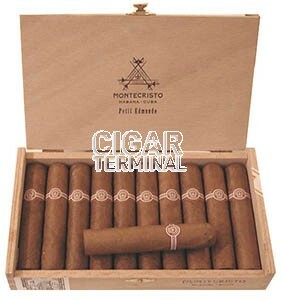 I wanted to give this Montecristo a try. The appearance and feel was superb. The light was good and smoke was full-bodied. There was no change in flavor from start to finish which is understandable for such a short cigar. Smoke time was 60 minutes with no re-lights. Cigars came promptly and in good condition. Love this diminished Edmundo. Very nice burn and draw..Can't beat the price. Thank you Cigar Terminal.